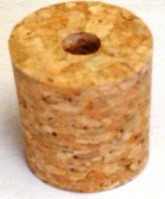 A single bored cork bung for sealing 1 gallon demi johns whilst your wine ferments. A single bored cork bung which can be used for holding an airlock in 1 gallon demi johns or in the hole in the lid of our standard 5 gallon wine fermenters whilst your wine ferments. Postage Charge: Whilst this item only weighs approx 45gms, it is too large to qualify for the Post Office's definition of a Large Letter and thus has to be packed and shipped as a Packet.